SM series emery roller rice milling machine is used for whitening brown rice, it can also polish white rice by changing the milling emery roller into the polishing roller. The biggest highlight is that the whitening grade can be adjustable through replacing different emery roller shapes and adjusting the width of rice blades and turning milling machine speed. 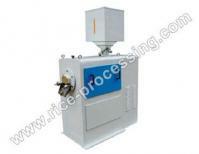 This milling machine have a wide range of application in brown rice whitening factory and rice mill production line. 1. Equipped with interior driven motor can reduce floor space. 2. Feeder controller guarantees rice flow even and uniformly. 3. Modular design is easy to operate and maintain, saving energy, long service life. 4. Adjustable whitening chamber makes the whitening pressure appropriate. 5. Easy to control and adjust for milling high quality and precision rice. 6. Low rice breakage rate, high rice output whitened, low rice whitening temperature. 7. Various models to meet your requirement. 8. Muti-functional usages for whitening and polishing. Our company is specialized exporter, manufacturer and supplier of SM Series Emery Roller Rice Milling Machine in 中国.